Like many players who go overseas, David Samuels was just trying to live out his dream of playing ball professionally overseas to hopefully get good enough to take his talents back to the state and play in the NBA. 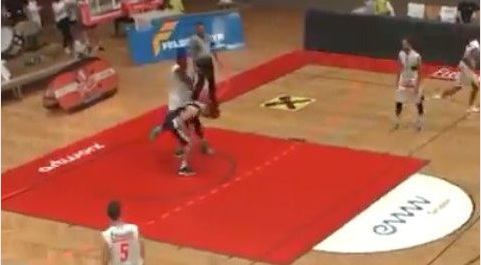 The Kapfenberg Bulls player more than likely will never get that opportunity after he didn’t take too kindly to being dunked on and responded with violence soon after. Erwin Zulic of the opposing squad had just sent down a nice dunk over the former Long Beach State player, but didn’t let go of the rim right away. Once he did release the rim, he was met with a swift punch to the back of the head by Samuels. “The player has to suffer the consequences for his actions, there’s no leeway and nothing to wait for.